The Isle of Lewis Chess set is another very iconic design of chess pieces, possibly the second most recognizable after Staunton. The Lewis chessmen are said to have originated from Norway in the 12th century but were not discovered until the mid 1800s when they were found by accident. A worker on the Isle of Lewis, Scotland, found a chest buried in the sand when a bank collapsed. Inside the chest was the original chess pieces. The find was hugely significant. The original chessmen are now museum pieces amidst much arguing as to where in the world they should be exhibited. Some argue they should be in London, England, for maximum exposure to the public whereas others believe they should be in a Scottish museum closer to the spot where they were found. Others are adamant that they should be on display in Norway, where they are believed to have originated from. 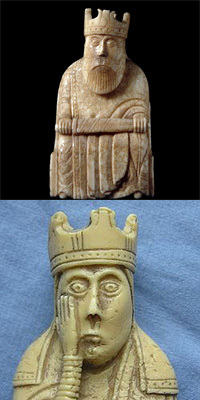 Today the Lewis chessmen are mass produced using molds, usually of resin or crushed stone composite material. They are made in a variety of sizes and to varying degrees of accuracy. There is an official set available that is produced from laser scans of the original pieces. They are produced by the national museum, Scotland.